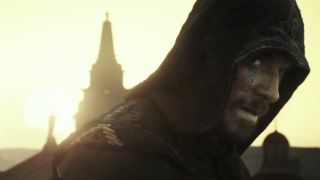 Given the success - or lack thereof - of gaming adaptations on the silver screen, the fact that Michael Fassbender decided to not only star in but also produce Assassin’s Creed was a bit of a stealthy surprise when it was announced. The good thing is that he knows there’s usually a problem when Hollywood attempts games but he’s got a somewhat more positive view when it comes to the free running historical franchise. When I visited the set of the movie in Almeria in December last year, Fassbender was asked whether it was risky taking on a video game movie and he was pleasantly honest. Given the fact I’ve watched the first fifteen minutes and at no point wanted to stab myself in the eyes with a fake hidden blade, the movie’s definitely on the right track so far. Directed by Justin Kurzel and starring Michael Fassbender, Marion Cotillard, Ariane Labed, Michael K. Williams, Jeremy Irons, and Brendan Gleeson, Assassin's Creed opens in US theatres on December 21, 2016 before being released in UK cinemas on December 26, 2016.